The entry level Tiguan S comes with air conditioning, stability control, DAB Radio, 16 inch alloys and an infotainment system as standard. The top end R-Line Edition comes with R-Line styling kit, front sports seats, Vienna leather, discover navigation system and heated seats as standard and can return 53.3mpg and reach speeds of 62mph in just under 8.3 seconds. For an SUV the handling is responsive and sharp with the diesel engines being powerful enough to handle most tricky road conditions. Boot space is impressive with up to 470 litres with the seats up, one of the largest boots in its class. Fold down the seats and you get 1,585 litres of space. The interior looks and feels expensive with a solid feel throughout. There are trim options also to choose from should you wish to upgrade. 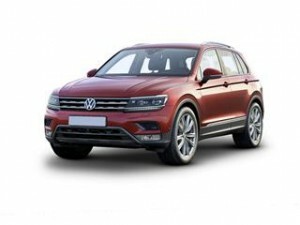 The impressive Volkswagen Tiguan could come at an even more impressive price thanks to our close network of franchises here at Coast2Coast Cars. Within our network of dealers we have specialist offers and deals on your new Tiguan. We save you time scouring the internet and emailing endless companies by bringing you all the deals in one place and online. Simply get a quote online now. Finance can also be arranged subject to status.